Related video report by Henry Ridgwell. “There were leaks, spills, in one case dating back to 1970, which have still not been cleaned up,” said Mark Dummett, the business and human rights researcher at Amnesty. FILE Crude oil from a Shell pipeline spill accumulates along a river bank in the Oloma community in the Niger Delta, Nov. 27, 2014. Shell was forced to stop extracting oil from Ogoniland in 1993 because of protests by local communities who said the drilling was causing too much pollution, but its pipelines still cross the region. Of the four sites Amnesty investigated, two of the spills happened in Ogoniland in 2008 and 2009. In a statement Tuesday, Shell said "widespread theft and illegal refining of crude oil" continue to cause new spills. 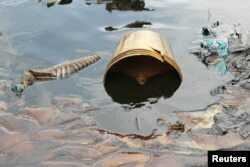 Shell said it "is committed to cleaning up all spills from its facilities, irrespective of cause." On its website, Shell says it has cleaned up all the sites in Ogoniland that were identified by the United Nations as polluted by its activities. Amnesty's Dummett says many people there can not work because oil slicks have destroyed the fisheries and farmland the communities rely on for their livelihood. Dummett said Shell is not the only one to blame for the lack of cleanup. He also took Nigeria’s oil spill regulators to task. “One of the problems or one of the things that we found at three of the four sites that we investigated was that government regulators had actually certified the Shell cleanup, meaning they had ticked them, they had approved them, they said ‘Yes, Shell, you have cleaned them up to the regulatory standard,’” he said. A spokesman for National Oil Spill Detection and Response Agency was not available for comment.